With increasing numbers of Canadian university students reporting an urgent need for help with mental health issues, postsecondary institutions across the country are rapidly expanding and revitalizing their approaches to service delivery for students experiencing high levels of stress, anxiety, depression and other serious mental-health issues. At McGill University, a new approach has been bolstered by $14 million, in part from the Montreal-based Rossy Foundation. The money will fund a new student health and wellness service centre, teams of clinically trained “local wellness advisors” embedded in faculties and departments, a one-stop website for student health and wellness information and appointment bookings, and online tools to help students manage stress and learn coping skills. It’s known as a “hub and spoke” model, with the Rossy Student Wellness Hub, set to open this September, acting as the physical space at the centre of all student health services, including counselling and psychiatric services. The local wellness advisors are the “spokes” connecting it to the rest of campus. The team of local wellness advisors at the Rossy Student Wellness Hub. 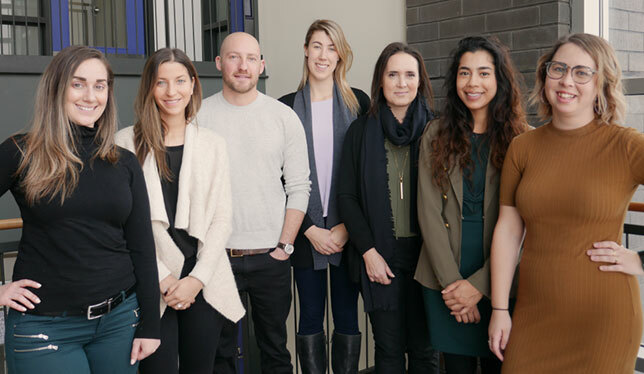 Left to right: Bianca Brunetti (arts), Lauren Weber (engineering), Zander Masser (music), Katelyn Ward (education), Shannon Walsh (Mac campus), Shrabani Debroy (law) and Cyndi Owen (residences). Photo courtesy of McGill University. “We’re reinventing how we work with students to ensure their psychological well-being,” says Vera Romano, director of McGill’s student wellness hub. Many months of research and consultation with students, faculty and staff at the university revealed that “the number one presenting problem” for students is anxiety and depression, says Dr. Romano. Sleep issues, difficulty juggling academic work with jobs, feelings of isolation and loneliness, and financial stress are commonly in the mix. McGill refers to the new approach as “holistic,” meaning students have many resources to choose from: one-on-one counselling, group psychotherapy, peer support, faculty-based health and wellness workshops, and online tools that help students form good mental-health habits to prevent more serious issues from arising. “It’s not just one modality, but more about matching services with the student, so they’re better tailored to their needs,” says Dr. Romano. She emphasizes that the services they offer are evidence-based and that their outcomes will be evaluated as students use these programs and services that are now available to them. The role of the advisor, says Ms. Walsh, is that of an “ambassador of well-being.” Advisors host themed wellness workshops and talks within the academic faculties, and offer students and concerned faculty members referrals to resources that would best suit the situation. “Freshmen have particular needs, international students have unique challenges. For them, we are rich connectors to resources,” she says. Eventually advisors will be embedded in residence halls, athletics and other departments. They will also be available for one-on-one appointments. McGill’s evolving response to student mental health is part of a larger trend on campuses across the country. Notably, institutions are seeing more involvement and funding from philanthropic foundations such as the Rossy Foundation, which is also in a partnership with the Mental Health Commission of Canada, Universities Canada and other groups to develop a national postsecondary student health and safety standard. “It does show how philanthropic organizations can have an impact on the mental health of students,” says Elizabeth Cawley, the Medavie Healthy Campuses Coordinator for the Association of Atlantic Universities. Dr. Cawley helped develop the AAU’s student mental-health service model based on the “stepped care” approach pioneered by Peter Cornish, director of counselling services at Memorial University. As with the McGill “hub and spoke” model, stepped-care gives students access to a spectrum of services, depending on the type and severity of their problem. Congratulations to McGill and best of luck. Perhaps you and “University Affairs” can publish an update in the future. So happy to see these resources put towards this issue and thanks to the Rossy Foundation.